Geraint Thomas is many things: Rugby fan; connoisseur of tasty ales; Tour de France champion; and yes, renowned author. His 2015 book, “The World of Cycling According to G” provided a humorous and revealing look at pro cycling, and chronicled his rise from Welsh junior cyclist to Olympic champion and Team Sky super domestique. It is no surprise, then, that Thomas has released a follow-up book in the wake of his 2018 Tour de France victory, co-written with BBC sports editor Tom Fordyce. The similarly titled, “The Tour According to G” was released in Great Britain this fall, and just became available in the United States this week. I enjoyed the book, and I consider it a must-read for anyone who wants a deeper look inside the 2018 Tour de France. The book takes readers along for Thomas’s ride, from his pre-race jitters through the final sip of champagne on the Champs-Élysées. He touches on many angles of the race, from Team Sky’s overall strategy to the challenges posed by his co-leadership role with Chris Froome. So what do we learn from Thomas’s book? Stage 9 will go down as one of the most dramatic grand tour stages in recent memory, due to the numerous crashes and constant chaos on the cobblestones between Arras and Roubaix. Richie Porte crashed, so did Froome, and numerous others. Thomas provides a detailed look inside Sky’s various disasters throughout the day, and how the team barely overcame the various crashes to keep itself in the race. The Roubaix stage was, perhaps, the most under-pressure Sky has ever been during a Tour. One of the most dramatic moments of the 2018 Tour de France came during the experimental 65km stage 17 from Bagneres-de-Luchon to the Col du Portet. Froome attacked the group of favorites, Thomas included, near the base of the final climb, sprinting up the hill alongside LottoNL-Jumbo’s danger man Primoz Roglic. 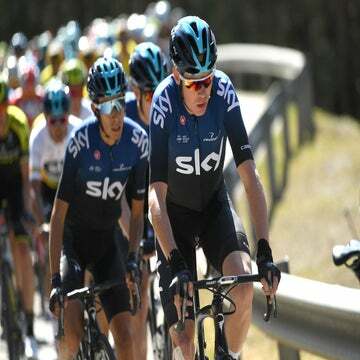 While Froome was eventually caught and dropped, the curious attack led fans and journalists alike to wonder why Sky was attacking its man in yellow. Apparently, Thomas was also miffed. He learned of Froome’s intentions to attack the night before the stage. Sky’s capos told Thomas privately that they thought Froome’s attack was too risky. Yet nobody told Froome to holster his gun and to simply ride to protect Thomas’s lead. When Thomas approached Froome about the situation the morning of the stage, Froome brushed him off. The move proved to be Froome’s last grasp at victory, and after the stage, he publicly said he would ride for Thomas’s victory. Thomas perfectly describes the bizarre Team Sky press conference that was held during the second rest day at a motor lodge in Carcassonne, France. 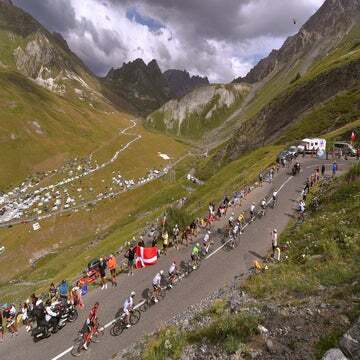 I was there, and I remember squeezing into a packed gazebo next to a comically small swimming pool to yell questions at Froome, Thomas, and Sky Principal David Brailsford. To no one’s surprise, most of the questions focused on leadership. Who was Sky’s real leader? How would the team manage the situation: Thomas in yellow and Froome just a few minutes behind? The answers we were given, in my memory, painted a picture of regular team meetings focused on management, leadership, and how to navigate the potential pitfalls created by the situation. Thomas and Froome were in regular contact, playing chess while everyone else stared at the checkers board. Well, that’s not entirely how it was. Instead, Thomas and Froome simply played things out on the road and relied on their longstanding relationship to overcome whatever moments could have created tension. After Froome attacked on a descent and was brought back by Sky domestique Michal Kwiatkowski, Thomas describes how the two worked things out. In the end, Thomas and Froome did find a way to ride alongside each other all the way to Paris. If there’s one thing “The Tour According to G” illustrates, however, is that it was hardly a joyride to the finish.